This vegan-friendly gnocchi is very simple to make – and easy on the pocket too. Use baked potatoes or left-over mash which is a bit dried up. Make sure the mashed potato isn’t lumpy and season it with salt and pepper. Put the mash into a large mixing bowl and add several tablespoons of flour. Use your hands to mix the potato and flour together and keep adding flour until the mixture comes together as a dough. Turn the dough onto a floured board and knead it gently, adding more flour as necessary – you will find that the more you squeeze the potato, the more moisture will appear! Once the dough is dry enough to stop sticking to the board, cut it into four portions and gently roll each one into a long ‘snake’. Use a sharp knife to chop the snake into short pieces and put these on a floured plate. If they touch each other, they are likely to stick together. Bring a large pan of water to the boil. 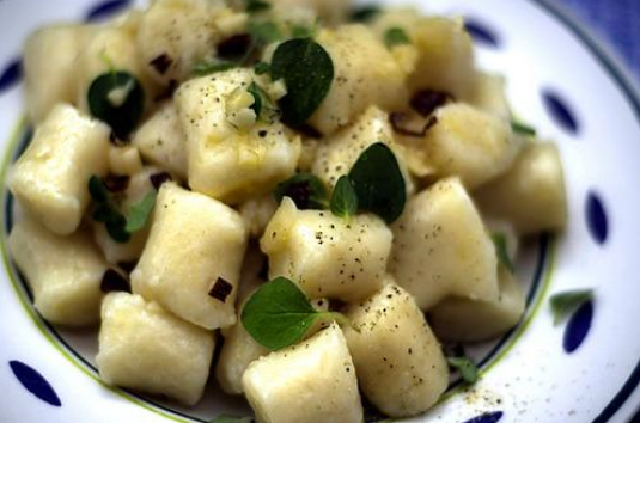 Drop a few gnocchi pieces into the water – not too many, otherwise they may clump. They will sink, and then rise to the surface when they are cooked – this only takes a minute or two. Scoop them out when they are floating. If you need to keep them warm while you finish cooking all the gnocchi, toss them with a little oil to stop them from sticking together. Serve with a little tomato sauce or vegan pesto, or simply sauté a clove or two of crushed garlic in some good olive oil or vegan margarine and garnish the dish with some chopped fresh herbs. This stuffed marrow with mince recipe is easy and delicious. You can use your favourite mince recipe such as bolognese or chilli (or vegetarian options) to stuff a marrow, so do experiment. Cheese is always good grated on the top, too. Always keep bananas separately from other fruits unless you want the other fruit to ripen quickly.